Katie from dna11.com sends this in: I wanted to let you be among the first people to hear this exciting new tip! 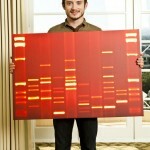 DNA 11 is partnering with Elijah Wood to create a very unique piece of art. They are creating a portrait from an actual sample of his DNA, auctioning it off on eBay, and 100% of the proceeds are going to a charity that he is a great supporter of: The Art of Elysium. The main page with all the details is here.